Kiku Matsuda is one of the most famous blade grinders in Japan. You probably have at least one knife which the blade was grinded by him. He has been working with some of the top knife manufactures in the US (William Henry, Pro-tech, Randall Kings). Kiku Matsuda has thirty four years of experience in blade grinding. He is fifth generation knife grinder. His unique grinds are well known in knife industry. Four hundred years ago his samurai ancestors fought in Sekigahara battle (Most profound battle in history of Japan). Kiku Matsuda, the new knife maker who has a magic hand in grinding and polishing the blades in any angles and directions. Unlike normal grinders, he uses a side flat area of the power wheel, that is his canvas to create any 3D grindings, concave, hollow, flat, Hamaguri (convex), twist, double and triple grindings in a free hand. He says his fingers move automatically from his imagination. This is amazing!!!!!!! His family was rewarded for bravely in battle and received large amount of property. For the next two hundred years his ancestors prospered. After Meiji era with modernization of Japan samurai were no longer needed. His family turned their attention to sword making. During the WWII there was a demand for swords, orders was placed by Japanese imperial government. As a young boy he helped his father grind the swords. After the war the demand for sword diminished. 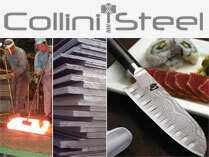 After WWII as Japans economy began to recover, knife manufacturing company regained prosper.